Food-to-go is one of the food industry’s most exciting areas, with many innovative products tested in this space. The Institute of Grocery Distribution (IGD), a non-for-profit which spearheads initiatives to help the food and grocery industry deliver what the public needs, has come up with a list of five trends they believe food-to-go will deliver on in 2018. The list is focused on the UK market but still contains valuable insight for those who work in the ready-to-go food sector within Australia and other countries. Head of Food-to-Go at IGD, Gavin Rothwell, said many of the concepts from across the world where food-to-go is growing are underpinned by healthy positioning. “The likes of Sweetgreen in the US, Cedele in Singapore, Chopped in Ireland, Exki in Belgium, Cojean in France and a number of examples in the UK are proof of the increasing role health is playing in products that are eaten on the go,” Rothwell said. Consumers should have more, and different, reasons to pick up food-to-go in 2018, including health conscious consumers after high-protein products. “UK retailer Waitrose spoke in late 2017 about a shift away from three fixed meals per day to four,” Rothwell said. 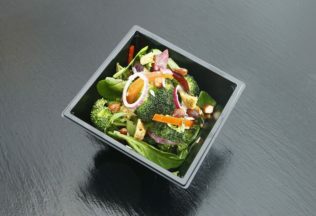 Workplaces, fitness centres, sports stadiums and festivals are increasingly offering food-to-go options says Rothwell. “The growing presence of street food in many markets is encouraging a more flexible approach to companies’ location strategies and is encouraging some to adapt their offer to a food truck format to take advantage of new opportunities,” Rothwell said. “In the US, the likes of both Whole Foods Market and Walmart are even bringing food truck concepts in-store. More retailers are expected to provide emotional engagement with their food-to-go options in 2018. “What many food-to-go specialists do well is create emotional engagement with shoppers,” Rothwell said. “The experience is based on the quality of the product, but is determined by a widening array of factors, including product display, in-store décor, customer service and more. IGD expects to see more partnerships between like-minded partners who want to develop food-to-go. “Part of this could include additional food-to-go specialists looking to target more on-the-go customers, such as working with railway companies and airlines, following the example of M&S and British Airways,” Rothwell said.